Wandering City Blues: Book Title, Release Date (and Launch Events) Revealed! Book Title, Release Date (and Launch Events) Revealed! Friends, I'm happy to announce that my first sci-fi novel has a title, a release date and two launch events across Virginia! Here's a promotional image with information. Yes, the title is going to be Wandering City Blues after all. I guess sometimes the answer's just staring you in the face. The fine folks at Comic Logic and The Ashburn Pub in Ashburn, VA, will be hosting a two-part local launch for the book on October 26th. Comic Logic is a fantastic comic shop and gallery that just celebrated its one-year anniversary. It's also one of the best comic shops I've ever been to (not just because they stock my other books, either). The Ashburn Pub not only has excellent food and drinks, but it's also in the same shopping center as Comic Logic, which is great because the October 26th pre-launch is a crossover event between both venues. Come see me at the comic shop throughout the day and pick up your signed copy of Wandering City Blues, and look in the back of the novel for a selective menu of cocktails based on the book. Then head over to The Ashburn Pub and try those same cocktails! The cocktails are designed by bartender extraordinaire, Ashburn Pub owner and Comic Logic co-owner Kevin Bednarz. Then on October 29th, the new novel will launch worldwide at Virginia Comicon's 30th anniversary convention. I currently have a panel discussion about Wandering City Blues confirmed and we're working on a launch party as well - more info to come. I'll also have a table at the con the entire weekend, so I'll be signing and selling copies of all four of my books. There will also be a giveaway of one-of-a-kind items throughout the show: the unofficial soundtrack, a free copy of another one of my books (your choice), the original handwritten outline for the novel, the filthy piece of paper in the ad above and more! The "and more" may include a plushie of one of the colossi in the book, a thumb drive full of digital goodies like an in-character podcast set at the emergence of the leviathans, gift cards or art prints, depending on what we can pull together by then. 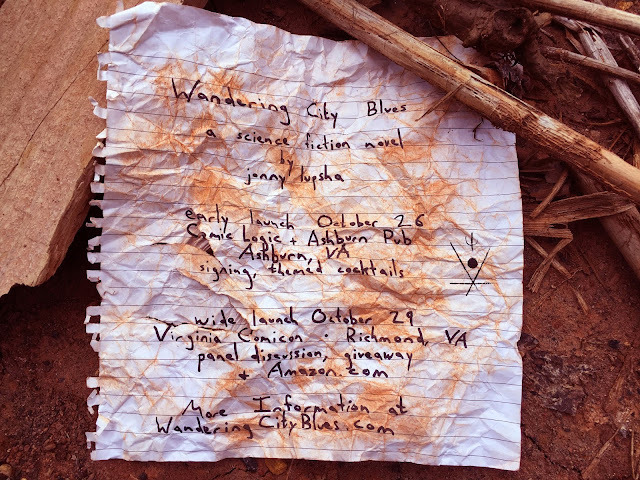 If you aren't in the Virginia area, Wandering City Blues will be available for purchase via Amazon.com on October 29th. Wandering City Blues is the fourth book (and science fiction debut) by jonny Lupsha. It begins 99 years after mankind has had to flee the surface of the earth due to a worldwide blanket of poisonous fog that rises from the sea. Fortunately for us, 13 different colossi, each reaching above the 1,000-foot fog ceiling, emerged from the Mariana Trench along with the fog. Immune to the mist, these weird creatures develop individual migration patterns and are entirely indifferent to humanity building cities on their backs for the 30,000 or so people left on the planet. With the entire planet a mass transit system, no central government or electricity, one titan populated by cannibals and a conspiracy on the horizon that could end civilization as we know it, Detective Leon Adler and his mysterious new partner Iris 13 just landed the case of a lifetime. Wandering City Blues is available worldwide on October 29th from publisher A Carrier of Fire. I really don't know how could I miss the release of the book. Probably I was too busy reading through this languageline.com site. Anyway, thank you for the heads-up, I am looking forward to reading this book.